Neither the U.S. nor Israel will attack Iran’s maturing atomic weapons facilities until the benefits outweigh the costs in spite of the latest unnerving report. However, that cost-benefit line is fast approaching. Last week the United Nation’s nuclear watchdog agency, the International Atomic Energy Agency (IAEA), released a sobering report about Iran’s accelerating atomic weapons program. That report sparked Israeli attack speculation such as an article in the British Daily Mail. Such reports may sell newspapers, but Iran is not “at the point of no return.” Even though the Iranian threat is growing and our options to deny Iran atomic weapons are diminishing, the costs associated with a pre-emptive attack still outweigh the benefits. Last week the IAEA for the first time said it believes Iran conducted secret experiments solely to develop nuclear arms. The chilling report said Iran created computer models of nuclear explosions, conducted experiments on nuclear triggers, and did research under a program called Amad that included at least 14 designs for fitting an atomic warhead on a Shahab missile which has a 1,200 mile range, enough to reach Israel. Admittedly there are still many technical issues to overcome before Iran can miniaturize a warhead and launch it somewhere. But those issues will be overcome which leaves Israel and the U.S. with the question: What to do now? Diplomacy, sanctions, and clandestine operations have failed to tear atomic weapons away from Iran. In 2007 then-presidential candidate Obama called for diplomatic “engagement” with Tehran “without preconditions” to solve the nuclear problem. But Obama’s diplomacy failed because Iran refused to talk. The United Nations Security Council has imposed four rounds of sanctions on Iran to persuade the rogue to cooperate. Obama hailed the 2010 round of sanctions as a strike “at the heart” of Iran’s ability to fund its nuclear programs. But the IAEA report makes clear Iran’s “heart” is still quite healthy because the rogue effectively circumvents the sanctions. It circumvents sanctions by relying on unscrupulous trading partners like Russia and China which coax domestic businesses to evade sanctions. 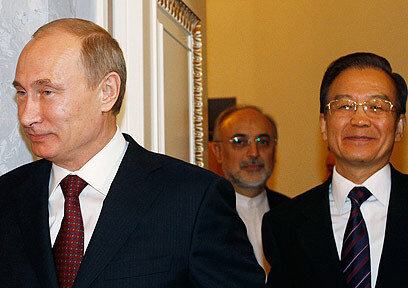 Iran rewards such “cooperation.” China’s oil imports from Iran rose 49% this year according to Reuters and just last week Iran asked Russia to build more reactors for the Bushehr nuclear plant, part of a $40 billion deal which includes five new nuclear plants. Covert operations aimed at sabotaging Iranian centrifuges with the Stuxnet worm and killing nuclear scientists haven’t worked either. The regime worked through the computer problems to install more sophisticated centrifuges for enriching uranium and the loss of the scientists hasn’t slowed weapons experiments albeit they are now more secret. That leaves two obvious alternatives to stop Iran from becoming an atomic-armed state: regime change and military attack. Regime change like those seen in Egypt, Libya, and Tunisia appears unlikely. Iran’s post-2009 election unrest provided an opportunity for regime change but the mullahs acted quickly to brutally crush dissent, which Obama effectively ignored. Military attack is the only alternative that hasn’t been tried. But it comes with significant consequences and as former Defense Secretary Robert Gates told the British Daily Telegraph, I think “a military attack will only buy us time and send the program deeper and more covert.” It would at best set back Iran by two or three years, Gates said. Any Israeli attack against Iranian facilities would not be like the 1981 bombing of Iraq’s Osirak atomic reactor or the 2007 strike against a Syrian reactor, both were pinpoint raids. Yes, Israel has the means – fighters, missiles, submarines – to attack a fraction of the Iranian facilities which number in the hundreds. But even if Israeli intelligence identifies the most critical weapons facilities it would have difficulty servicing them all without significant American assistance, especially if the operation required more than a single strike. American support is not a given, however. Obama may need the American Jewish vote for the 2012 election but he doesn’t want $300 per barrel oil which would be a likely outcome should Israel attack. That would push America’s foreign-oil dependent economy into another recession or depression, a certain re-election killer for Obama. Therefore, if the Daily Mail’s report is accurate, and Israel is actively considering a military strike, then Israel’s leadership must decide between two bad choices: accepting a nuclear armed Iran or the consequences of a pre-emptive strike. Of course Jerusalem should defend itself if in fact it knows Iran has an atomic-tipped ballistic missile and is planning to launch it at Israel. But this does not appear to be the case. And as strange as it might seem Israel still might choose to accept a nuclear Iran believing it will eventually collapse and is unlikely to use atomic weapons. This issue is coming to a head because Israeli Prime Minister Benjamin Netanyahu and his cabinet may be on the verge of a decision. This week they meet to hear from Sha’ul Horev, director general of the Israel atomic energy commission, as well as representatives of the foreign ministry and intelligence community. Likely that meeting will review the threat, attack options and perhaps consider the following consequences should Israel attack. First, an Israeli attack will draw Iran’s proxies Hamas and Hizbullah into a war with Israel. This will be like simultaneously experiencing the August 2006 rocket war with Hizbullah and another Palestinian intifada, “uprising.” Also, because America supports Israel, U.S. troops in the region will be targeted by Iranian Quds Forces. Second, there will be Iranian-hosted terrorist attacks against Israeli and American interests. Last month the U.S. foiled a Quds Force-sponsored plot in Washington, DC to blow-up a restaurant in order to kill the Saudi ambassador to the U.S. Likely there are more sleeper cells in the U.S. and Hizbullah is known to associate with Mexican cartels and rogues like Venezuela’s President Hugo Chavez. Third, Iran will retaliate using conventional and unconventional (chemical and biological) armed ballistic missiles. Almost two weeks ago, perhaps in preparation for both an attack and defense, Israel hosted a nationwide air raid drill, test-fired a nuclear-capable missile, and hosted air force drills that included refueling for long-range flights. Fourth, Iran would try to stop all shipping in the Strait of Hormuz through which passes 40% of the world’s sea-borne oil. Iran has perfected guerrilla warfare in the Persian Gulf using mines, anti-ship missiles and small boat swarms. Finally, an attack would alienate many Iranians who are sympathetic with Western views. Popular resentment to an attack would help Iranian mullahs rally support for a more aggressive nuclear program and for striking back at Israel and its supporters. For now the costs of a military strike against Iranian nuclear sites outweigh the benefits. That leaves us with a mixed bag of old options: sanctions, containment, deterrence (air defense shield and equipping partners) and the overthrow of the regime by domestic forces. These options must be rigorously pursued while America and Israel prepare with other allies for a possible military attack and the day Iran inevitably steps across the cost-benefit line.